Fort Mason in San Francisco, is a former Army post dating from the Civil War and divided into Upper and Lower Fort Mason with the Great Meadow in between and more wheelchair outdoor attractions nearby. The main draw to the 50-acre upper section is the expansive lawns of the Great Meadow where on most days you will see picnickers (no picnic tables), people throwing Frisbees, dog walkers, and even sunbathers on rare warm days. Its location on a bluff top provides some nice views of the bay, including Golden Gate Bridge, but it also means that it can be windy here. Level access to The Great Meadow is best at the eastern end. Wide, paved, gently sloping paths circumnavigate the meadow winding past a few statues. Inside the fort complex you can visit a community garden, stay at the accessible Fisherman’s Wharf Hostel, and take a self-guided history tour. Lovely views of the Bay, Alcatraz Island, and the municipal pier are at the backside of the complex and from the Bay Trail (aka MacDowell Rd.). Lower Fort Mason, on the waterfront, is home to the Fort Mason Center, a thriving cultural and educational complex with theaters, galleries, museums, a gourmet vegetarian restaurant, classrooms, exhibition spaces, and nonprofit organization offices including Environmental Traveling Companions that offers guided whitewater rafting, kayaking and ski programs to people with disabilities and disadvantaged youth. A farmers market takes place every Sunday, 9:30 am-1:30 pm. Trailhead: Accessible entrances to Upper Fort Mason are on Bay Street at Franklin Street, MacArthur Ave., and Van Ness Ave. Accessible entrances to the Great Meadow are at the Bay Street parking lot, the west end of MacArthur Avenue, and at Laguna Street. Of the two Laguna Street entrances the one closest to Bay Street has a gentle grade; the one closer to Marina Boulevard is steep. The trail’s entrance from the foot of Van Ness Avenue (near Aquatic Park Municipal Pier) is very steep. 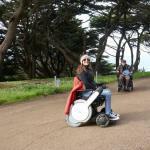 Both manual and motorized wheelchair users will be able to easily explore accessible highlights of Upper Fort Mason however, manual wheelchair users and others with reduced mobility may find the sloping topography around the meadow, and getting from lower Fort Mason, to upper Fort Mason, requires effort. At the western side of the meadow, look for signage that indicates the accessible route to Lower Fort Mason; the steeper more direct route may be manageable to some wheelchair users. A section of the Bay Trail runs along a cliff at the backside of Upper Fort Mason. It’s lined with eucalyptus and cypress trees but still affords views of lower Fort Mason, the Bay and Golden Gate Bridge. The trail’s entrance from the foot of Van Ness Avenue (near Aquatic Park Municipal Pier) is very steep. Alternatively you can also reach the trail from the Great Meadow and then travel a few hundred feet further before it travels steeply downhill towards Van Ness Ave. Adventurous and skilled wheelchair users may be able to travel this section––assistance may be required. In Upper Fort Mason, to reach the vista point of the Bay and remnants of Black Point Battery and an authentic cannon, follow the sidewalk towards the water at Franklin Street to its end. All of the sidewalks in the upper fort complex have curb ramps. 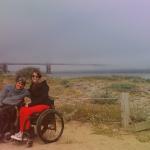 Accessible Parking: Upper Fort Mason: Accessible spaces are at the west end of MacArthur Avenue by the Great Meadow; in front of and behind the GGNRA offices; on Franklin Street across from the church; by General’s Residence; and within the quad. One is on Funston Road by the hostel and several are in the lot off Bay Street at Octavia Street. 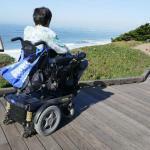 While the only designated van accessible space is on MacArthur Avenue in front of the GGNRA headquarters, others because of their wide size, may work for some vans with lifts or ramps. Lower Fort Mason: Numerous accessible spaces are in the fee lot. Accessible Restroom: Yes, in upper Fort Mason on the south side of the Great Meadow; in lower Fort Mason, while not considered public restrooms, there are accessible restrooms throughout, in particular within pier 2, lower level of building C, and at the Conference Room at 308. Accessible Picnic Tables: Yes, Two exemplary accessible tables in upper Fort Mason are by the hostel with nice views of the Great Meadow. There is space for multiple wheelchair users. Others are in the community garden. Trailhead: You can pick up the trail from the Fort Mason Center, anywhere along the Marina Green, and at the parking lot off Yacht Rd., by the St. Francis Yacht Club. To explore lower Fort Mason you must traverse parking areas where the pavement can be cracked and bumpy, and you may encounter old rail tracks. Trucks loading and unloading by the exhibition halls can impede travel. From Lower Fort Mason, follow the sidewalks west along the bay, passing rows of yachts moored in the San Francisco Marina Yacht Harbor’s East Harbor. 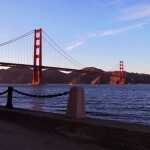 Soon you come to the large, flat lawn known as the Marina Green, which is especially popular on weekends for kite flying, picnicking, playing volleyball, basking in the sun, or just sitting and enjoying the sweeping views of Alcatraz and Angel Island, the Golden Gate Bridge, and Marin County. The Green hosts many events, including serving as headquarters for Fleet Week every October. Several workout stations are along the perimeter. At the harbormaster’s office on the west end of the Green, the Promenade turns left, then right, following the contours of West Harbor along Marina Boulevard, then right again where Baker Street ends at Marina Boulevard. At low tide, an accessible boardwalk here offers the opportunity to get to a small sandy beach where you can observe the ebb and flow of the tides. At the parking lot for the St. Francis Yacht Club, a right turn takes you past a small lighthouse and the Golden Gate Yacht Club, onto the jetty to visit the Wave Organ, a unique treat. The jetty path is rough but manageable. The Wave Organ is a stone “sound sculpture” built with chunks of old monuments and buildings from the 1915 Panama Pacific International Exposition, which was held in this area (the Marina Green was formerly a marsh, filled to accommodate the Exposition, in part using debris from the 1906 earthquake). Then the trail winds gently down into the organ, where at high tide you can hear the gurgling tones of the pipes. But the sound is not as interesting as the place itself. I sat on the jetty shrouded in fog, my view across the water obscured except for glimpses of Alcatraz Island across the water, and had a wonderfully eerie sensation of being at sea. Returning to the parking lot near the St. Francis Yacht Club, you can either retrace your route or continue along the Golden Gate Promenade past the Presidio’s Crissy Field, all the way to Fort Point, at the foot of the Golden Gate Bridge. The Fisherman’s Wharf Hostel is not at the SF Wharf, but near the bluffs in Upper Fort Mason. Guests are able to stay in Building #240, which was constructed in the 1860’s. 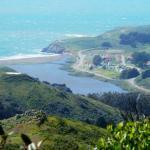 Operated by Hosteling International, it’s a great place to meet travelers. The upper floor is fully accessible and has great bay views; accessible accommodations, including a roll-in shower and roll-under kitchen sink and stove, are available. Download a brochure of the Fort Mason History Walk, a self-guiding tour that takes you on a walking tour of Fort Mason, as well as explaining where examples of historic building styles can be found on this former army post. The fully accessible chapel can be rented. There is an accessible parking space and ramp entrance. Inside there is an accessible restroom, accessible access to the stage, and companion seating at the pews. Call to reserve (415) 345-7557. After exploring Fort Mason, you can extend your trip to the west by taking the Golden Gate Promenade along the Marina Green, through Crissy Field, and still further to Fort Point. Be sure to check out the Wave Organ, a wave-activated sound sculpture on a jetty jutting into the bay at the marina. To the east you can explore San Francisco Maritime National Historic Park, but to reach it from Upper Fort Mason requires negotiating some very steep hills and while it’s doable in a motorized wheelchair, it’s advisable to drive or take public transit. • Maritime Museum is in the Bathhouse Building at 900 Beach Street (at Polk).